Welcome to Motherhood Monday. I hope you enjoy these weekly REAL stories of my motherhood journey. This story starts with a simple load of laundry. I threw a load of towels into the wash machine Sunday afternoon. That night, I did NOT fold the dreaded white load of socks, etc. that was in the dryer, so the wash load sat in the dark machine. 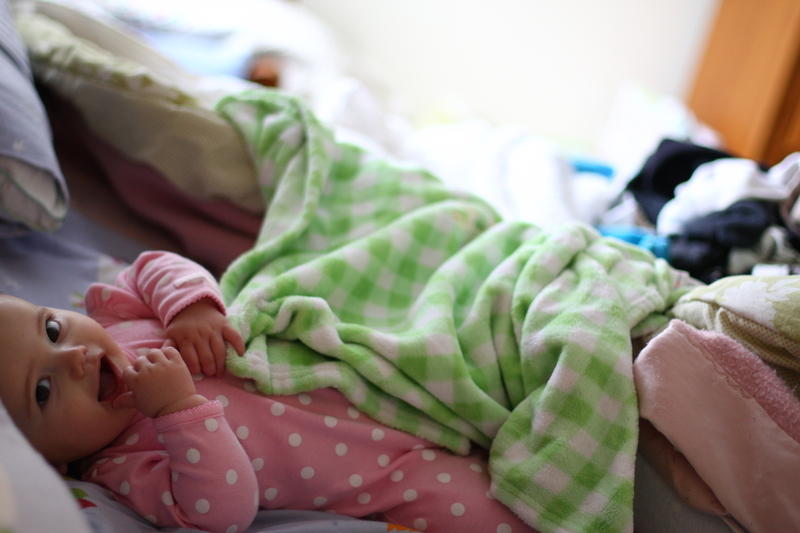 Then in the middle of the night, Adeline woke up with a fever of 102. She had it on and off all day, and a trip to the doctor’s office ruled it a virus and the she definitely couldn’t go to school Tuesday. The wash continued to sit in the wash machine. I had a work meeting that I couldn’t miss Tuesday morning, so Matthew took the morning shift and I took the afternoon. When I got home, I nursed Adeline, gave her some Tylenol and soothed her back to sleep. Then I ran the wash machine again, with hot water and lots of soap because those towels were a bit smelly. Gross. However, I still didn’t fold those socks. Tuesday night she was up every 2 hours. Wednesday I stayed home with her, bleary eyed, wearing the same white shirt I wore Tuesday and pajama pants. I took those socks out and plopped them on my bed, thinking I could fold them and get those towels in the dryer. As soon as I emptied the dryer, she started to cry and the wash still sat. Finally, she fell asleep for 45 minutes in her swing, but then woke up crying and gassy. I changed her and cuddled her and she fell right back to sleep. Fearing that she would wake up again and hardly being able to stay awake myself, I took her to our bed. I crawled into bed with her, on Matthew’s side though since my side had that pile of socks on it. After about an hour and 15 minutes, I woke up to her babbling, smiling and looking right at me. We got up, I changed her diaper and then nursed her. Then, while she played on the floor, I started that load of towels again – for the third time. This time, they went right in the dryer when the machine stopped. I still need to fold the socks. I love this post – and I feel ya! I’ve had days like that too – vinegar really helps the smelliness! Hope Adeline is feeling much better this week and that you got some sleep! I hope she is feeling better. Some weeks are like this huh? Thanks for sharing, I like this new segment. The laundry will linger but so that precious nap and the picture you snapped of it is what you will remember. Thank you for this post! As a working mom of two little kids this has happen to me more than once. Sometimes you have to remember that being a mommy is more important than clean and folded socks. It’s all about balance. I love this, because this is so REAL and honest. And, believe me, I’ve had several loads of laundry that have been washed at LEAST three times because I keep forgetting or get too busy. I’m always leaving something in the washer. Usually my sister or I will discover it within the day and it doesn’t have to be rewashed. But there’s been a handful of times that another cycle has had to be run on those once-clean-now-yucky laundry. In my next house, the laundry will not be in the basement. This has happened SO.MANY.TIMES. to me. I usually leave the laundry in the machine, realize it, dry it and re-wash it. If I just wash it again without drying first it still stinks. I always feel bad about wasting the water and energy to do this stuff twice, but the kids come first. Thanks for sharing this post! I remember days like this. And my baby is almost 23 years old. Your children will never remember anything about laundry matters when they grow up but they will remember how their mom took great care of them when they were sick! Oh yes, in fact I’m pretty sure I have a load out out there in the wash right now. Sometimes I don’t remember until I go to put another load in, because there were too many things going on in between. Hope your sweet girl feels better soon! 1 cup vinegar in with the wash will fix that sinky smell. Works great in every load. You will smell nothing when you take them out of the dryer. Buy a big jug and keep it beside your detergent. It can go in every time! Vinegar is a miracle liquid. 😉 I have 3 sick boys here and the laundry from this tummy-sickness is a full-time job. @Tracy- Do you put this in the actual washer or in the detergent dispenser? I have a front load washer and have been trying different things to combat the stinky smell coming from the washer. @Kristin, my washer repairman said to leave the door open to let the inside of the washer dry every few days. It’s worked for my front loader. I also agree on the vinegar. I use a lot of it! Loved this post for it’s honesty. I try to leave the door open too. I also have Smelly Washer cleaner (http://www.smellywasher.com/), which works great. I actually treated my machine today. Yes, I do. I have a front loader as well and I put the detergent in the detergent spot. Then I pour a cup of vinegar into the softener spot (I use dryer sheets). When I was using liquid softener, I would pour the vinegar in there anyway! 🙂 Vinegar even solves my teenager’s B.O. gym clothes, and my dh’s work socks. I have saved linens from my grandmother’s musty attic with vinegar in 2 loads. Sometimes I can smell vinegar as I am transferring to the dryer, but I never smell anything at all when they come out to be folded. This is fantastic. I’m trying this with my next load! Thanks so much for the advice. Oh, how many times I have done that! Sorry poor Adeline was sicky, but thanks for sharing that story. Girl, we have all been there! I have laundry days like that and I don’t even have a little one, some loads are washed or rinsed three times before I finally get them in the dryer, one time I had forgotten to turn the dryer on and they went back into the washing machine again after they laid in wet pile over night.,. wow how hard can it be to be organized? Wow. I can totally relate. My two kids came down with the stomach bug last week. I’ve held feverish babies, washed laundry multiple times, and then rewashed again because I was way to tired to tend to the laundry. Oh, I knew it was there, but so didn’t want to deal with it! Hope Adeline is getting better. We’re on the mend as well. I have done that more times than I should admit! I always forget about laundry in the wash and it always seems to be towels that soak in the smell the most! I have definitely washed the same set of towels three times before. I hope you sweet baby girl is feeling better! The timing of this post is perfect. Who knew that I would get such great advice and encouragement on laundry. Thanks for sharing!! I have my youngest daughter in cloth nappies. I haven’t been keeping up with the clothes washing lately but I do a load of nappies every day. It’s been so hot that I hang the nappies outside on the line but don’t get the other nappies off the line, I just pop outside & grab one as needed. It has been about a week, this morning to escape the older girls squabbling I went outside & brought in all the nappies, well & truly sun-bleached. The worst is when you think the wash is still ok, you hang it out, fold it & sort it only to discover when you are sitting down next to a mountain load of clean & folded washing that it stinks & you have to start all over again! I do this all the time. I have 3 baskets of clothes to fold and one in the dryer. The last load I washed I washed twice because it sat too long!